Find out how BlackRock become an asset management giant in less than three decades. In the business world, we hear it all the time: Differentiate. Be unique. Stand apart from the crowd. The problem is, the vast majority of companies don’t know what that means or how to do it—let alone do it right. With $6.28 trillion in assets under management as of December 2017, BlackRock, Inc. can teach these businesses a thing or two. BlackRock financial is the largest investment management company in the world. It has clawed its way to the top of the asset management game by utilizing differentiation tactics to great effect. By setting itself apart from the rest, BlackRock now sits at the top of the industry, head and shoulders above the rest. In case you’re not familiar with the firm, let me share with you a bit of background about the company and then we'll take an in-depth look at how it has become so successful. Founded in 1988, it was first known as the Blackstone Group and focused on fixed-income securities. Their clients' trust was important to gaining and retaining business, so they knew they had to focus on clients' needs. With this objective, the company began spearheading innovations. These included developments of trusts, defined contribution plans, closed-end funds and many others. One of the results of its initial efforts was the birth of Blackstone Term Trust. This trust was a pivotal milestone for the company. It raised a staggering $1 billion. This alone propelled the firm toward unrivaled growth and success. But that was only the beginning of BlackRock’s cornerstone developments. This investment platform successfully combined client reporting, risk management, and trading. This platform is known as the company’s central nervous system and has proved to be its crowning achievement. It’s what distinguished the company as a leader in investment and risk management. It’s also what ultimately gave rise to the BlackRock Solutions business. 1992 is when the firm changed its name from the Blackstone Group to BlackRock. At this point, they were only four years into business yet already boasting $17 billion in assets under management (AUM). Two years later in 1994, that figure increased by leaps and bounds to an astounding $53 billion AUM. Today, four of the eight original founders are still with the company as executives, including CEO, Laurence (Larry) D. Fink. And the firm has grown from a small group of co-founders to over 12,000 employees and 135 investment teams that stretch across 30 countries. BlackRock’s name is often seen with competitors Vanguard and State Street. Together the trio comprises the three largest money management firms in the nation. Though they do manage some active funds, they’re better known as passive investors. But more about that in a bit. The company’s vast accomplishments in such a short period of time are astounding, to say the least. Many companies take much longer to achieve the growth that BlackRock did, and it’s particularly challenging to gain the market share it has, given the industry it’s in. That’s because the global investment management industry is highly concentrated in nature. In an industry that has about 70,000 funds, about 99.7% of the U.S. fund flows went into just 185 funds in 2012. Additionally, many fund managers claim that over 50% of their inflows go to only three funds. That level of limitations and concentration makes it tough for newcomers to compete. However, BlackRock has been able to seize a dominant position in this concentrated industry—by capitalizing on market change and offering diverse products. Today, it does more than just manage exchange-traded index funds. With CEO Larry Fink at the helm, the company has cast a wide net over the entire asset management business. And this is, in part, what’s made it so appealing to its customer base because its competitors can’t claim to have done the same. Even the likes of Vanguard, Fidelity, and State Street Global Advisors can’t compare to BlackRock’s pull in fixed-income securities and equities or the product spectrum it offers to the market. As we mentioned, BlackRock has its hands in many aspects of the asset management space. It offers exchange-traded funds (ETFs), manages active investments, and offers more than 600 mutual funds. This means that aside from passive, it also has its hands in active investments, though it chooses to focus largely on passive because of its undeniable appeal to clients. These funds provide exposure to equity, fixed-income, commodity, and multiple-asset funds. Its mutual funds also implement strategies including active, indexing, income-generating, college savings, and managed volatility. They also surpass the performance of the average mutual fund. To participate in a BlackRock mutual fund, investors must invest a minimum of $1,000 plus pay an average annual expense ratio. The return investors of BlackRock capital have seen in the last 25 years vary, but Fink says that a well-balanced portfolio of stocks and bonds can yield about 4%. A historical view of the past twenty years shows that returns have ranged from -2.6% to 38.75%, depending on the asset class. As you can see, BlackRock has a lot to offer investors because everyone wants the right investment. And no one wants to make a terrible mistake because of having limited options. Apart from its diverse products, what’s the secret behind BlackRock’s rapid success and how did it manage to scale to such extraordinary heights in such a short time span? The quick answer is that this firm has gone to great lengths to differentiate itself. But if you were to dig deeper, you'd find two key moves at the root of its success. First, it has capitalized on the boom in passive investing and has mastered the ETF better than any other competitor. Second, it’s relied so heavily on technology that it’s been labeled a tech company as opposed to an asset management firm. Let’s dive a bit deeper to see how it achieved each of these. Active and passive investing are terms that are familiar to most investors. And for those who aren’t familiar, the differences between the two are actually quite simple. Active investing is what used to simply be called "investing". This was basically when you bought or sold individual stocks or bonds. Nowadays, active investment means something starkly different. Today, active investing is when you put your dollars into mutual funds. Managers of those funds then act or decide what should remain in or leave your portfolio. Active managers keep a close eye on your portfolio. And it’s thought that because of this, they'll be able to snag a better return for you. But passive investment is where we see the most traction these days. Passive investments follow indexes, or clusters of securities that share some similarity. For example, if you invest an index fund that owns all the stocks in the S&P 500, you’re investing in a passive fund. Exchange-traded funds (better known as ETFs) are another common passive investment vehicle. In essence, they are marketable securities that track a commodity, bonds, an index, or a group of assets, like an index fund. Put simply, ETFs are mutual funds that are traded like a common stock through a stock exchange. The prices of ETFs can fluctuate throughout the day as they are bought and sold. ETFs are an attractive option for investors because they have higher liquidity and lower fees than shares of mutual funds. For several years now, investors have shoveled more money into passive funds than active. Many of them believe that low-cost funds that track the market are the best investments. This belief has helped push BlackRock to almost $6.5 trillion in assets. Streams of new money into U.S. equities are finding their way into passive funds instead of active ones. And the most heavily traded securities on stock exchanges each day are ETFs. But those aren’t the only factors influencing the dip in active investments. It’s bad enough that investors aren’t putting money into active, what’s even worse is that they’re actually also pulling money out of it. In fact, in 2016, investors pulled over $380 billion from active investments, pushing that and more into passive investments, totaling almost $480 billion. And this is a trend that isn’t going away. The only silver lining active investments have is that they still have more in assets. They boast $10 trillion compared to $5.8 trillion in passive investments and ETFs combined. For almost a decade, passive funds have almost steadily outperformed active ones. The stock market growth in this period of time has been gradual but constant, and volatility has been low. This has made it difficult for active managers to exceed the results passive investments offer. Investor confidence in passive strategies, as a result, has jumped from 11% in 2000 to 43% in 2015, according to a 2017 UBS study. Thanks to confidence in passive investments, BlackRock, a big passive investor, has benefitted. For some time now, there’s been a global rush of investors wanting to put money in passive investments. As a result, BlackRock has been able to take advantage of this opportune time. Investors have been frustrated with mutual funds. They charge higher fees and don’t perform well compared to stock market indexes. This has led to a sudden boom in passive investing. And BlackRock has greatly benefited from it. But with giants like Vanguard in the running, how exactly did BlackRock steal such a big chunk of the passive space? BlackRock seized passive investments by becoming the master of ETFs, a type of passive investment. In 2005, the firm bought out State Street Research & Management. Then in 2006, it did the same with Merrill Lynch Investment Managers. Later, in a monumental move, it bought the largest asset manager of its time—Barclays Global Investors. Along with that sale came Barclays’ tower of ETFs, called iShares. The acquisition of these ETFs was a crucial turning point for the firm and profoundly changed its trajectory. After these acquisitions, by 2009, BlackRock had already claimed the spot of number one asset manager. Then it became the parent company of the iShares family, the largest ETF provider in the world, using its leverage to make ETFs more popular than they'd ever before been. 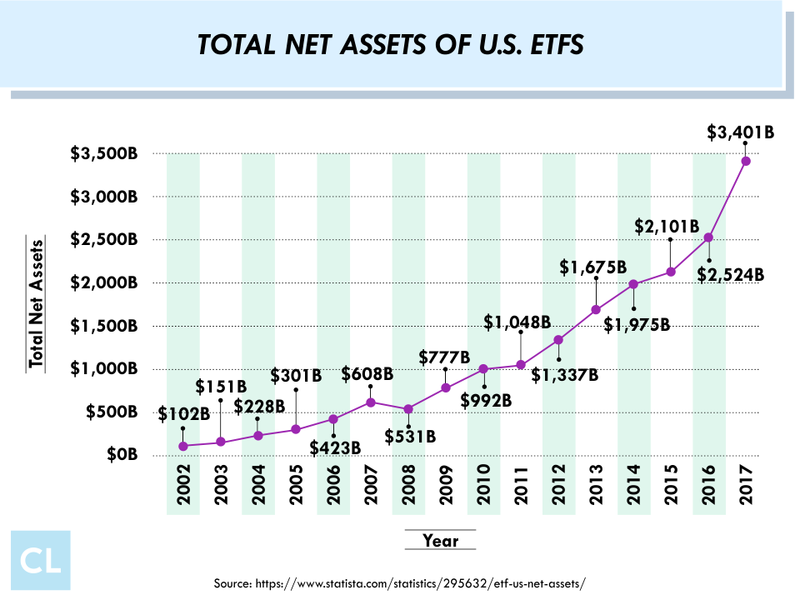 In fact, investors have since placed more than $1 trillion in over 800 iShare ETFs—a number that continues to grow. Soon, BlackRock’s ETFs became so popular that it started stealing market shares from other asset managers even when the market was dragging. This caused their AUM to rise, despite dreary market conditions. In 2017, BlackRock even reported a 9% spike in its second-quarter earnings because investors kept tossing money into ETFs. Part of the reason why ETFs were such a huge success with investors is that cost and quality are top of mind for them. ETFs have both of those attributes, plus they allow investors to build the diversified portfolios they desire. For BlackRock, ETFs cost next to nothing to construct. All the firm has to do is package different securities in a new way, add a unique name to it, and the find the right market. The beauty of iShares funds is that they concentrate on everything from preferred stock to home construction and biotechnology to emerging markets. This means that ETFs can attract investors from a wide range of investment interests. Blackrock’s stockpile of index funds and ETFs means it owns more shares in American companies than anyone else. When Fink was asked his opinion on the hordes of investors dumping loads of money into ETFs, his response was simply that clients are no longer looking for products. Instead, they’re interested in tackling whatever will give them the best outcome. Since ETFs seem to have the right mix of everything to entice investors, they’re the natural choice. But BlackRock isn’t limited to just selling ETFs and has its hands deep in the asset management world. Mutual funds, closed-end funds, college saving plans, and retirement income, for which it has its own name, CoRI, are just a few of its other offerings. BlackRock aims to offer unique products.For example, saving for retirement can be tough, but its CoRI retirement indexes make it easy to plan. These are a series of age-based indexes that help you plan for retirement and determine how you'll generate funds post-retirement. Each index allows you to evaluate, up to ten years prior to retiring, how much income your current retirement savings could generate for you. The cool thing about the indexes is that they give you a realistic picture of future costs. This helps you determine how much you'll really need to retire and, with this knowledge, you can plan ahead for smart ways to save for retirement. BlackRock is a publicly traded company that has no majority stakeholder. It provides alpha for active products and minimal or no tracking errors for index products. It leverages its global reach and commits to implementing best practices around the world. It offers diverse active and index offerings and tailors single- and multi-asset solutions to clients' needs. It continues to focus on technology and risk management. It continues to develop diverse BlackRock Solutions products and services. It achieves client objectives and keeps those at the forefront of its focus while also delivering excellent customer service. It attracts, retains, and develops skilled professionals. 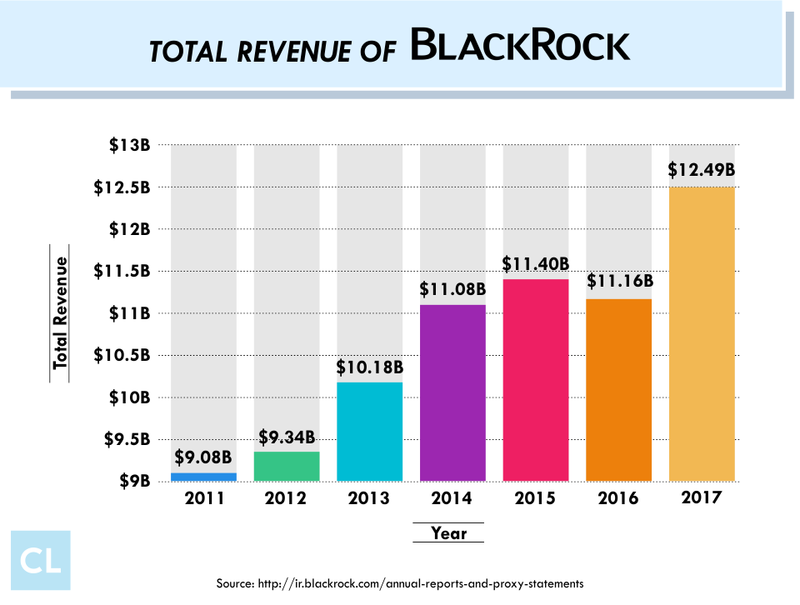 BlackRock makes its earnings in several ways. It earns investment management fees, performance fees (on certain portfolios), and sometimes even securities lending revenue. The firm also generates revenue by offering its proprietary investment system, Aladdin, as well as outsourcing, advisory and technology services, and risk management to institutional investors and wealth management intermediaries. We’ve established how BlackRock has tackled passive investments to capitalize on opportunity. So let’s look at the other cornerstone of its success: its technological advantage. Advances in technology and data sciences are reshaping traditional methods of equity investing. Blackrock is at the forefront of that change. Case in point is its cherished one-of-a-kind platform, Aladdin. Short for “Asset Liability and Debt and Derivative Investment Network”, Aladdin manages $15 trillion in assets on its platform. To put this figure into perspective, this equals about 7% of the world’s shares, bonds, and loans. The beauty of this platform is that it can widen or narrow from a broad view of firm-wide risk to homing in on a single trade in no time at all. And BlackRock has refined this platform nearly every time it acquired new assets. For example, the ability to monitor stocks and European markets was added in 2006 to the platform once the company bought Merrill Lynch Investment Managers. Of course, we know that it gained knowledge of ETFs when it bought Barclays in 2009. During the Great Recession of 2008, the Fed used the platform when it took on Bear Stearns' assets. At this point, Aladdin was already well acclaimed for its precision. The fact that this platform is the company’s single most unique differentiating factor is no coincidence. Fink has made sure to place both risk technology and data analysis front and center of the company’s focus from its very conception. BlackRock is a clear advocate for leveraging technology to grow its business. Fink goes as far as to state that nowadays, using technology is no longer a differentiator. It’s a requirement to compete in the financial services arena. “Technology has always been a core component of our value proposition, and a significant differentiator for BlackRock,” Fink said. As a firm believer in the power of technology to transform lives and entire industries for the better, I felt this statement from BlackRock’s CEO resonate with me personally at a deep level. I have always known that betting big on technology and client satisfaction was the way to rake in huge returns. In fact, I have done the same with all the companies I founded, especially with CreditLoan.com. Since Aladdin, the company has continued to search for ways to invest in technology. They’ve even acquired robo-advisors like FutureAdvisor, a software-based portfolio manager. This transaction made BlackRock one of the first top financial services companies to purchase a robo. And then, once it had the robos in hand, it took it a step further and leveraged them to help distribute its iShares ETFs. Taking a cue from its extraordinary success with Aladdin, BlackRock continues to identify other ways, besides robos, to run several aspects of its operations. For example, its active equity investment platform relies more on lower-priced strategies based on quantitative computer models. In fact, Blackrock relies heavily on Aladdin as its risk management operating system to distill vast stores of data into investible insights for investors. That’s why it was able to reduce its active equity team by a few dozen people. The platform also uses massive computing power to rationalize complex financial operations. Typically, it even captures the details of securities trades, values both liquid and illiquid portfolios, and measures the associated risk. The versatility and incredible precision of this software is exactly why the U.S. government relied on it to value the portfolios of on-the-rocks entities like AIG and Bear Stearns during the financial crisis. The government’s confidence in Aladdin paid a huge compliment to BlackRock. It also proves that the firm’s efforts and investments in technology were spot on. In its latest efforts, BlackRock is moving away from human-driven processes. Instead, it’s relying on automated systems to help it select and sell stocks. With its success around technology so far, you can’t blame this firm for moving full steam ahead toward automation. While its luck with passive investments and technology has certainly catapulted BlackRock forward to success, there are other factors that have contributed to its growth. For the past few years, BlackRock’s shares have been outpacing the market and have been trading at a premium cost because the company has been able to do something most competitors, with the exception of Vanguard, couldn’t. It’s been able to reel in assets more quickly. Another reason for its success is that it does well in managing risk for its actively managed portfolio. For example, BlackRock used to be a leader in mortgage-backed securities. But it proactively analyzed the risks of these securities by zip code. This allowed it to avoid the need for a government bail-out when others were seeking it, which is the main reason the government turned to it for advice on how to keep the financial industry alive during the recession. 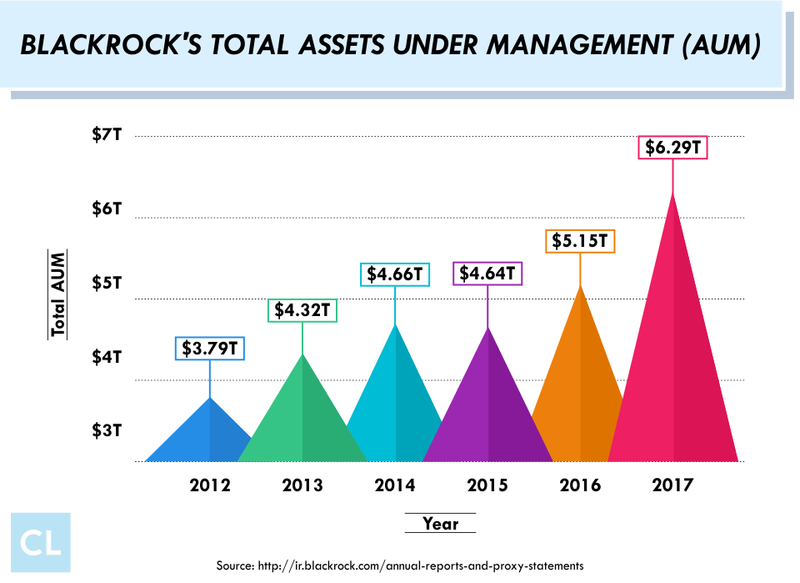 The rise of BlackRock’s stock price has solidified its greatness in the asset management space. In 1999, its IPO was at $14 a share. Fast forward almost two decades, and it’s multiplied that value exponentially. Today it sits at around $539 a share. Which currently puts the company’s value at over $62 billion. While its meteoric rise might make speed seem like its greatest attribute, BlackRock’s strategic insights, unwavering focus on its objectives and its continued push toward improvements prove that success requires far more than speed alone. It requires patience, perseverance and a lot of grit. BlackRock is the world’s largest investment firm. And it got there through differentiation. It accomplished this mainly by capitalizing on the boom in passive investments and by being a technology-driven company. Combine these with its voracious appetite for strategic acquisitions, and you'll see how BlackRock was able to do in a few short decades what most financial institutions probably can’t in a lifetime. While that’s certainly no easy accomplishment, BlackRock proves that with the right mix of ambition and strategy, it’s not an impossible one either. What are some of your most favorite companies that were able to dominate their respective niches? Do you know what strategies they used to soar above their competitors and differentiate themselves? Feel free to post your thoughts on the comments section below, we'd love to hear from you!